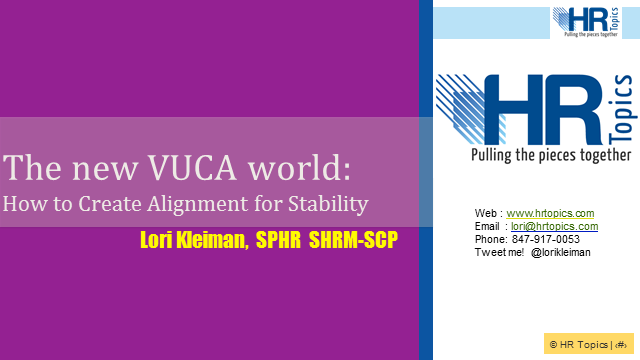 The new VUCA world - and getting HR aligned for long term results! The world is ever changing and our organizations and employees are doing all they can to keep up. What do you, as a HR leader, have to do to adapt to this new and volatile environment? The days of going off to a retreat and planning carefully are long gone. Now you have to adapt and change course on the fly! Join us for tips and tricks to creating strategic alignment with change in a way that is manageable for your HR function! Title: The new VUCA world - and getting HR aligned for long term results!